Born Melvin Horace Purvis Jr., Oct. 24, 1903, the most famous "G-man" of the 1930s is known for two things. 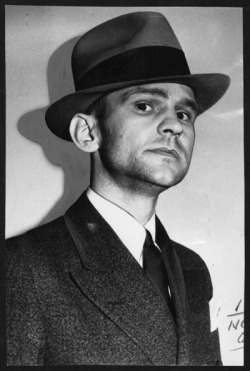 First, as the federal agent responsible for helping kill John Dillinger and Pretty Boy Floyd, and secondly, for having his own career killed by his boss, J. Edgar Hoover. Son of a well-to-do tobacco farmer in Timmonsville, S.C., Purvis graduated from The Citadel Military Academy and, in 1925, from the University of South Carolina with a law degree. After a short time with a South Carolina law firm, he moved to Washington, D.C., in 1927, and landed a job with the Bureau of Investigation, a branch of the Justice Department. The bureau had recently come under the command of John Edgar Hoover, a bright, young lawyer who gained his appointment with political connections. At the time Hoover took command, the department was small, poorly-run and lacked direction. Hoover had big plans to change that, and he knew he needed men like Purvis in his department to help him achieve that goal. Purvis proved to be an excellent field agent and quickly rose through the ranks. He was one of the few agents given special attention by Hoover for rapid advancement. In less than five years, Purvis headed offices in Birmingham, Ala., Oklahoma City and Cincinnati. In 1932, he was given the plum assignment of heading the Chicago office. Small in stature (five-feet-four-inches tall and 127 pounds), Purvis was referred to as "Little Mel" by the press, and even by Hoover. Purvis spoke with a soft Southern drawl, and was famous for saying very little about himself or his cases. His success, however, was marked by his painstaking diligence in his investigations. Beginning in 1933, John Dillinger, Harry Pierpont, Russell Clark and Charles Makley, went on a violent spree of bank robberies throughout the Midwest, but mostly in Ohio and Indiana. In a matter of months, the gang stole an estimated $150,000 (in the millions in today’s dollars). After their arrest in Tucson, Ariz., in January of 1934, where they had gone into hiding, Dillinger was extradited to Indiana to face charges in that state, while the others were returned to Ohio to face charges there. In an infamous escape from the Crown Point, Ind., jail on March 3, 1934 - allegedly using a wooden gun - Dillinger drove a stolen car across state lines. That was a federal offense (bank robbery wasn’t), and that put Dillinger into federal jurisdiction. Dillinger’s escape made police look like idiots, and Hoover saw a chance to make his department look good. Within 48 hours, Hoover ordered Purvis to develop a network of informants to get Dillinger, who was deemed "Public Enemy No. 1." On April 23, 1934, Purvis received a tip that Dillinger, Homer Van Meter, John "Red" Hamilton, Tommy Carroll and George "Baby Face" Nelson were hiding out at an off-season resort lodge in Rhinelander, Wis., known as "Little Bohemia." Sometime after midnight, Purvis and several agents drove to the lodge and parked their cars some distance away. They walked into the woods toward the lodge, but without a map or firsthand knowledge of the surroundings, they stumbled around creating noise and confusion. As they got closer, the lodge owner’s dogs began barking, and three of the lodge’s regular drinking customers went outside to see what was going on. When they exited, the agents assumed they were gang members, and opened fire. One customer was killed and the other two wounded. The gang, meanwhile, alerted not by the barking dogs but by the gunfire, had managed to get away by jumping out back windows of the lodge and running into the woods. Later that day, FBI agent W.C. Baum was killed, and two others were wounded, when they found Baby Face Nelson hiding in a nearby resort. Nelson managed to escape, as did the other gang members who where hiding elsewhere. (See Little Bohemia link on this site for the full story). Dillinger was involved in a shootout with police in St. Paul, Minn., a few weeks later, and Dillinger, Nelson, Van Meter and others robbed a bank in South Bend, Ind., in June (see South Bend link on this site for that full story). The Little Bohemia disaster gave a black-eye to Hoover’s department, and he vowed to double his efforts to get Dillinger.